Welcome to this third Global Forum on Responsible Business Conduct. It is very encouraging to see so many people from government, business, trade unions and civil society working together. This Forum is becoming a transformational instrument to address one of the most important challenges of our times: mainstreaming responsible business conduct. 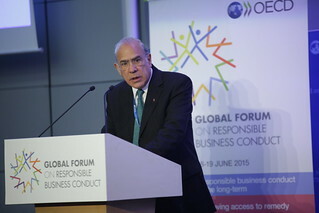 18 June 2015 - OECD Secretary-General Angel Gurria speaking at the opening of the 3rd Global Forum on Responsible Business Conduct. I want to congratulate DAF for the organisation of this event and for keeping the engine going for three years! This is a vital part of our work as an international principle- and standard-setter, and we must keep pressing ahead. Multinational enterprises (MNEs) make an important contribution to development and economic growth in both home and host countries – through job creation, human capital development, efficient capital distribution, and technology, knowledge and skills transfers. But to reap these benefits and restore trust, business has to be conducted responsibly. Businesses also stand to gain from acting responsibly. Responsible businesses are more likely to obtain and retain the “social licence” to operate, a critical component of profitability and long-term business strategy. Responsible business practices are also an efficient way to manage risks, diversify portfolios, and increase productivity. For example, environmentally friendly production processes can significantly decrease overall costs and effective management of labour practices in supply chains can boost productivity and protect brand capital. And it is the only way to recover trust in corporations. According to the 2015 Edelman Trust Barometer, only 57% of people in the nearly 30 countries surveyed trust businesses. Responsible business conduct can help correct this loss of trust. Considerable progress has already been achieved. The OECD’s Guidelines for Multinational Enterprises were updated in 2011. Just last week, G7 Leaders committed to concrete actions to promote responsible supply chains and to strengthen the National Contact Points (NCPs) for the OECD Guidelines. And the same call on strengthening NCPs and broadening adherence to the Guidelines was made by OECD Ministers, who launched an updated Policy Framework for Investment (PFI) with responsible business conduct at its centre at their annual meeting here on 4 June. Today we will be hearing from Assistant Secretary Rivkin about progress on the United States National Action Plan on Responsible Business Conduct, based on the OECD Guidelines and the UN Guiding Principles for Business and Human Rights. The European Union has also adopted a new directive on “disclosure of non-financial and diversity information” aiming to transform the way social and environmental issues are considered in the largest European businesses. We will hear more about its expected impacts from the European Parliament Rapporteur on Corporate Social Responsibility, Richard Howitt. In another sign of progress, the European Parliament has voted a regulation on imports of minerals from conflict areas, based on OECD guidance on responsible minerals supply chains. Here in France, the Parliament is discussing new requirements for global supply chains, based on due diligence expectations set out in the OECD Guidelines. And the United Kingdom (UK) recently enacted into law due diligence requirements for the most severe human rights abuses. Last but by no means least, we are working with the Chinese authorities to exchange experiences and share lessons learned on what constitutes good business practice. We recently co-organised a workshop in Beijing on responsible business conduct and are working directly with Chinese industry to promote responsible mineral supply chains which will apply to over 6000 Chinese companies. I am delighted that there is a whole session devoted to China’s approach to RBC on the agenda this afternoon. These developments are impressive – they show that across the globe we are making progress towards transforming responsible business conduct principles into law and other binding instruments. However, as clear as this progress is – it is also clear that change does not come to those who need it the most as fast as it should. The reality of the Rana Plaza victims that waited two years for compensation is a clean example that compels us to do more and to do it faster. This is why we want to take a fresh look into what are the most urgent areas that deserve our renewed attention and focus. And 2015 is the right year for deciding on such priorities. During the next six months, we hope to reach global agreements on the new development and climate agendas. RBC is an integral part of those agendas, and I urge you to come out of this forum with a long-term vision to ensure that responsible business conduct supports global sustainability and inclusive growth. Some priorities are obvious, such as making sure companies pay their fair share of taxes, achieving greater policy coherence, supporting the transition to a low carbon economy and strengthening accountability for adverse social and environmental impacts of business activities. Others relate to small and medium sized enterprises, and how to support them in both developed and developing countries to meet societal expectations on issues such as human and labour rights and environmental protection, so that they can fully benefit from and contribute to global value chains. Other challenges are even more complex to ensure that workers in the informal sector are not marginalised and that the right balance is found between business activity and the protection of fragile natural sites. On all these issues we will continue working with governments, businesses and civil society, and catalyse our efforts towards the most critical areas, in support of these global goals. As you will see from the discussions in the next two days, we are making progress - but now let’s make sure that such progress continues and that it reaches the people it needs to. I know that through your commitment and cooperation we can ensure that responsible conduct becomes a part of the DNA of doing business globally. So I urge you to be bold, creative and forward-looking. Let’s design, deliver and implement the responsible business conduct our societies and our planet urgently need. Thank you. I’d like now to invite Roel Nieuwenkamp to the stage, who will be moderating the next session.